I didn’t, but I heard about it and am very intrigued by the idea. I actually like Renoir (it seems as though everyone has that one Impressionist they think is the visual equivalent to white noise and mine is… Monet! ), but Manet is definitely one of my art historical crushes. Love him. I saw the exhibition last month in London. It was packed with people and, though I’m very glad to have seen it, the sheer pressure of numbers was an issue. Many of the paintings are stunning, I especially liked the portraits of Berthe Morisot and the works for which Victorine Meurent modelled. There are a number of unfinished works and it is interesting to see these because they do show something of his process, others were unfinished at the time of his death and were later completed by “other hands” and I am not certain what was achieved by including them. another actor. To take up another point in your post, I think too that Manet’s handling of the colour black owes quite a bit to Velazquez. Hello François! Thank you (merci!) for this quote by Zola. It is exactly the information I hoped to find. I’m also very glad to know that there was a switch to the layout of the Salon exhibition in 1880 (moving from alphabetical order to different categories of artists). That is very interesting. Hi Anne! Thanks for sharing your take on the exhibition! I did not know that the show included paintings that were completed after Manet’s death; they were not mentioned in the exhibition film at all! The film also didn’t really discuss the portraits of Berthe Morisot, which was disappointing to me. 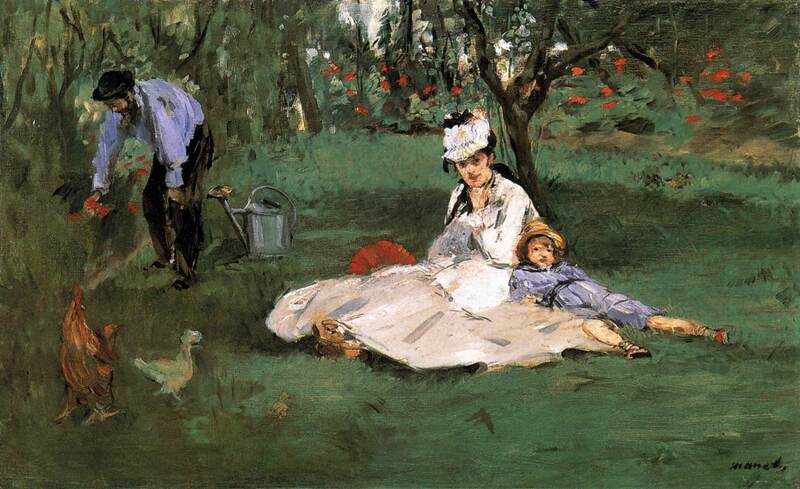 I did, however, like that the film highlighted this same comparison that you mentioned between Velasquez and Manet. Thanks for including the links to those images! I noticed during the film that Velasquez used as monochromatic background for his portrait of Pablo de Valladolid. If Manet was influenced by the blank/monochromatic backgrounds found in many carte-de-visite photographs, he also could have found similar inspiration in the works of 17th century painters like Velasquez. Hi Hels! You raise a great point about Velasquez and modernism. I think Clement Greenberg would argue that Manet is “the first modernist” because he breaks up the perspectival space and illusionism in his works of art, especially in paintings like “Le Déjeuner sur l’Herbe.” But I do think that Velasquez has a painterly quality which “celebrates” the surface of the canvas, something that Greenberg would have liked. However, I do think that the topic of “the first modernist” is up for debate. In the early 20th century, there was a collector in Washington DC, Duncan Phillips, who felt like El Greco was the first modernist. Phillips acquired El Greco’s “The Repentant Saint Peter” for his modern art collection; he felt that El Greco began to experiment with abstraction and color in a way that anticipated the art of later centuries. Hi heidenkind! 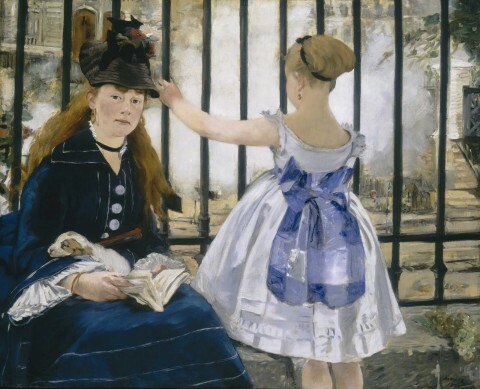 If there is one crush to have out of the whole 19th century, I think Manet is a good one to choose! It’s so tragic that he died at only 51. One can only imagine how he might have changed the art world even further, had he lived longer. The Portrait of M. Arnaud was definitely identified in the accompanying caption as having been finished by another hand after his death. I did think that this applied to at least one other but I can’t be sure now which it might have been. I have just come across this review which relates to the issue of finished and unfinished paintings in the exhibition. Hi Anne! Thanks for these links. I had a colleague mention that he read some negative reviews of the show, which makes me wonder if he came across this review that you mentioned. I can see why people would be disappointed at seeing unfinished works (or works finished by a different artist). Thanks for the link to the podcast lectures; I’m excited to listen to these. Cheers! As an artist I have to admit that painting in black is difficulte. It’s the darkest color – the shading is impossible, you can only use the lighter color to create illusion of the object being three-dementional. Olso I am an art historian and I write works on the subject of Fine art. I am sure that you will enjoy the reading. Hello Subject-Art: Thank you for your comment and the links! I am not a painter, but I imagine that painting with black is very difficult. But will art exhibits work at the movies? Unlike new opera and theater performances, just about every piece of art from current exhibitions can already be viewed over the Internet. And the exhibits will be a documentary film, not a live event. Hi Hazel! I think you have brought up a good point. 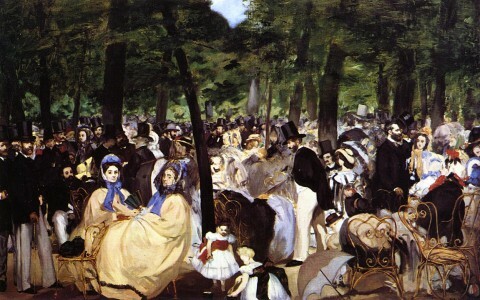 The film was a bit more like a documentary, since there was quite a bit of background information about Manet and his life. I suppose one of the benefits was that the painting details were blown up onto a huge cinematic screen, instead of just a small computer or tablet screen. It was quite exhilarating to see larger-than-life-size details of impasto! Hi. I think Hazel and Anne raise a couple of very interesting points. I was lucky enough to see the show in London but as I too was intrigued as to how it would on the big screen, I also went along to the cinema to see what I thought was an excellent film. The film’s director Phil Grabsky acknowledged in an interview on BBC Radio 4 that there is nothing better than seeing the art in real life, and that the film’s intention was to be a ‘next best thing’ for the many people who would not be able to attend an exhibition in London or Ohio. In this regard – as a ‘next best thing’ – I think the film succeeded within the limitations of the format, which cannot deliver a comparable experience to attending in person (unlike in the live relay of theatre where I have sometimes felt I was getting a better experience than the audience at the National Theatre). But what are we to do if (as in mine and Anne’s experience) the gallery is so overcrowded that even attending the exhibition in person becomes a compromised way to view the work – another ‘next best thing’? If the Royal Academy cannot provide something closer to the ‘best’ way to view the art it displays surely something is going seriously wrong? I strongly feel that galleries need to address the issue of overcrowding – and such cinema screenings are not the answer. Exhibitions either need to sell fewer tickets or, for example, open through the night. When they are promoting a show as once in a lifetime experience, surely they have a responsiblity to both the paintings and the visitors to be allowed to spend more than a few seconds in each other’s company before the crowd shuffles them on? Hi Mark! Thanks for your thoughtful comment. I agree that the issue of overcrowding should be addressed, and cinema screenings are not the right way to solve this problem. Perhaps ticket prices should also go up on certain days, in order to encourage people to visit shows during the week (or before the closing weekend?). It’s ironic how museums are compelled to hold these “blockbuster exhibitions” in order to attract crowds, but such large crowds can ruin a visitor’s ability to truly experience the art on display. Is art the highest thing that is valued in an art museum? I would hope so!